Replacement Hyd-Mech Saw Guides are"Always In Stock"
Aftermarket replacement Hyd-Mech Saw Guides at a lower cost than anywhere else. No Screws! We innovated the HydMech Replacement Blade Guide by Brazing on the carbide using robotics and induction heating. This means there is more surface area for blade support, no shattered or missing pads, resulting in bad cuts. Using our CNC grinding machine we achieve ?guide flatness within .0001", a tolerance that no one in the industry can achieve. This provides an overall better, longer lasting product for less money. The steel backing is also stronger as we utilizes thicker guide backing to eliminate flex and warping. Both sides of the guide are precision ground. Hyd-Mech® is a registered trademark of Hyd-Mech Saws. Hydmech Bandsaw Blade Guides - 1.50. 4 guides are required per machine. 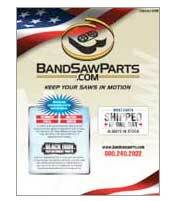 These Guides support the Sawblade during cutting holding the blade Perpendicular to Saw Base. This guide has a 5/16" tapped center hole; this will fit all H-18 machines with a serial number ending in "S".